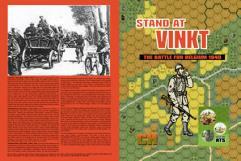 Includes 10 scenarios that all play on the historical map + Battlefield Walkaround, AFV Cards + color folio and, of course, a new historical map. Ships imminently - expected to pack up next week. Requires ownership of ATS Rulebook 2014, plus German and Belgian Personnel + Belgian AFV sheet + German AFV sheet.